After a series of tutorials on word problems involving numbers, we now move to learning on how to solve word problems involving age. 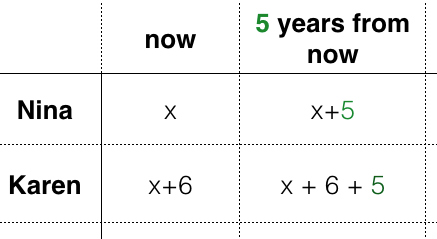 Age problems are very similar to number problems, so if you have finished reading The Number Word Problem Series, then it will be easier for you to solve the following age problems. Benjie is thrice as old as his son Cedric. The sum of their ages is 64. How old are both of them? This is one of those age problems that are very similar to number problems. Let’s take a specific case. If Cedric is say years old, then Benji is years old. This means that if Cedric is years old, then Benjie is . If we add their ages, the result is . Let be the age of Cedric and be the age of Benjie. Dividing both sides of the equation by gives us . Therefore, Cedric is and Benjie is year sold. is thrice and . So, we are correct. Karen is years older than Nina. Five years from now, the sum of their ages will be . How old are both of them? If Nina is years old, then Karen is years older, so her age will be . 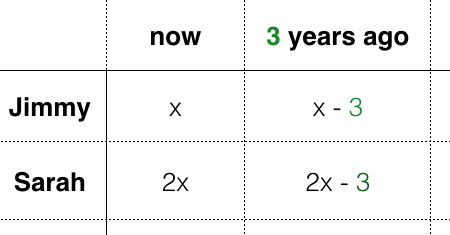 Five years from now, both of their ages will increase by as shown on the table below.
. Now this sum is equal to . Let be Nina’s age and be Karen’s age. In 5 years, Nina will be years old and Karen will be years old. This means that Nina is and Karen is . is 6 more than and five years from now, . Therefore, we are correct. Sarah is twice as old as Jimmy. Three years ago, the sum of their ages is 39. How old are both of them now? If Jimmy is years old, then Sarah’s age is twice his age, so Sarah is years old. Three years ago, both are younger by years, so both their ages must be subtracted by . Let be Jimmy’s age and be Sarah’s age. Three years ago, Jimmy was years old and Sarah was years old. So, Jimmy is and Sarah is . Three years ago, Jimmy was years old and Sarah was years old. The sum of their ages was . That’s all for now, we discuss more problems in the next post.